The ancient marble steps leading through the doors to French Gothic Notre Dame are slightly grooved from centuries of weekly worshipers. You can feel it under your feet as a reminder that you are merely one of millions who have gone before you – people on pilgrimages, wandering vagabonds, visiting kings and queens, street people, modern day gypsies, students of ancient art and architecture and folks just like you and me who are in awe of the grandeur and the sacred space. As we arrived the bells for Sunday mass were tolling and a long line was forming for entrance; a huge Christmas tree decorated in blue bulbs stood in the entrance courtyard and it was brutally cold and windy. I was almost hyper-ventilating from reverence and excitement. I lit candles and said some silent prayers; I tried to catch my breath as I wandered through. I knew I had to come back again the next day when there might be an empty pew where I could sit and spend more time. My photographs do not begin to reveal the size and scope I was seeing. The proportions in the nave are astounding. There was not an empty seat in the place. And I returned the next day, every bit as anxious as I had been the first time, on Monday, my final day in Paris. After wandering for an hour or more, taking more pictures, I found the gift shop and purchased some little six inch Notre Dame Christmas angels crafted from what looked like humble material and a few gold charms for necklaces. Treasures that will become family heirlooms…for some treasured people in my life. I cannot help but wonder how many people down through the ages, no matter their beliefs about a higher power, have journeyed to this magnificent place of worship, praying for peace on earth. For me, Notre Dame is a symbol of hope, an ancient wonder of a place, begun in 1163 and mostly completed by the 14th century. The famous flying buttresses support its walls and roof, heavily damaged during the French Revolution. In the South Tower hangs the cathedral’s original bell, 13 tons, named Emmanuel ( all the bells are named) which announced the liberation of France from the Nazies in 1944. Emmanuel is extremely important to French history. The bell was recast in 1631 from copper and bronze, and Parisian women threw into the pot their precious gems and jewels, thus incorporating them into the bell. In 2013 as part of Notre Dame’s 850th anniversary since construction began, nine new bells were installed replicating the original chimes. Notre Dame is very much the center, the heart and soul of Paris, in both location and adoration. You must go visit her. She is a beauty. 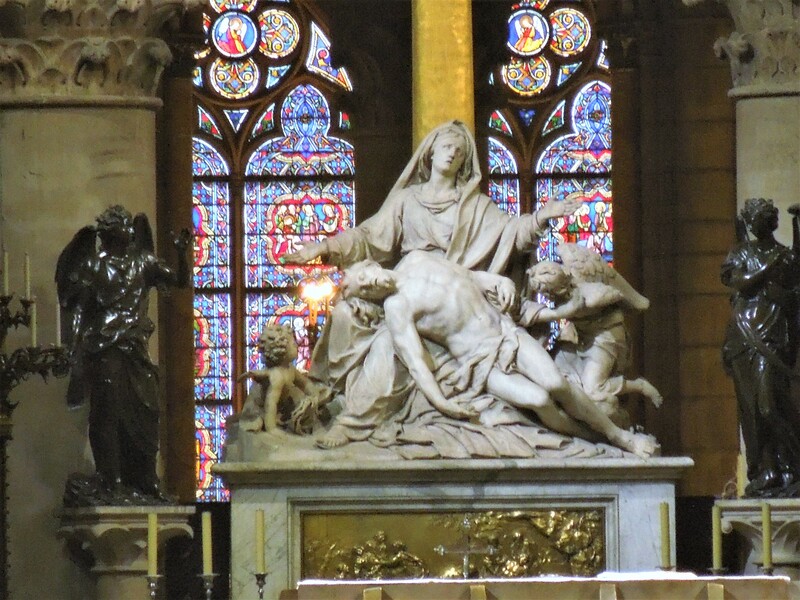 Additional photos of Notre Dame and my entire Paris trip can be found on my Instagram pages at The Creative Epiphany and on FB under Jo Ann (Rossiter) Brown-Scott.